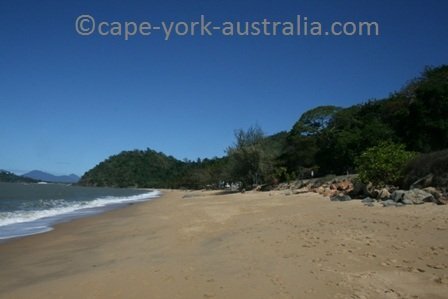 Trinity Beach queensland is one of the Cairns Northern Beaches. 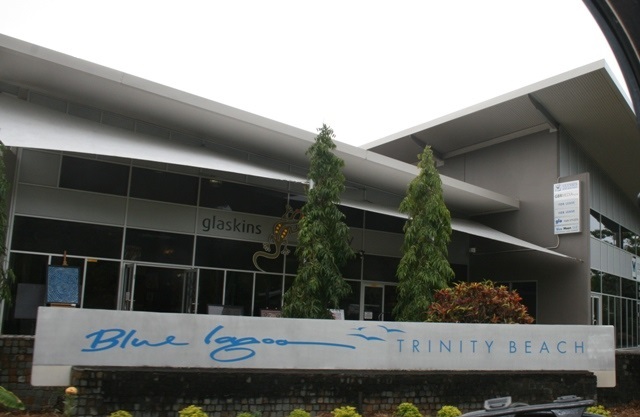 It is popular with locals as well as travellers, and many Cairns people like to come here for a lunch during the weekends. The beach is nice although it is not very long. 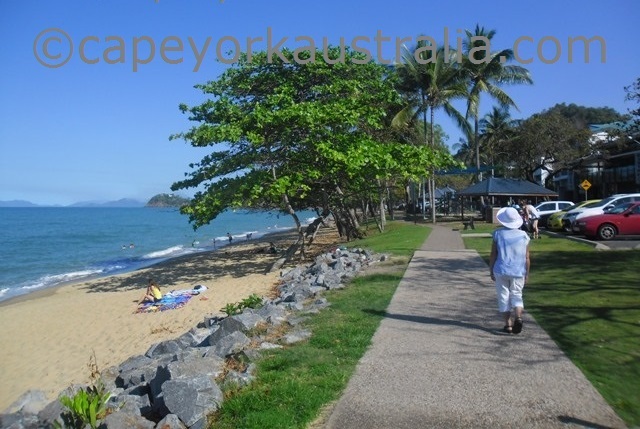 Like other Cairns Northern Beaches, Trinity Beach is a small suburb with a small shopping centre, a supermarket, a newsagency, a takeaway shop and the usual. ... some on the beachfront with great views. 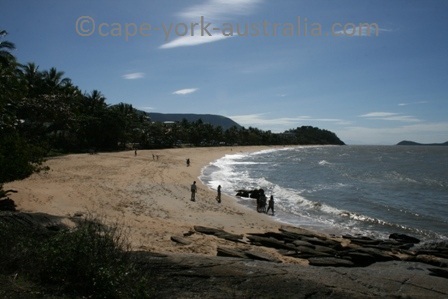 ... and there are also picnic tables on the beachfront, to bring your own lunch and enjoy. 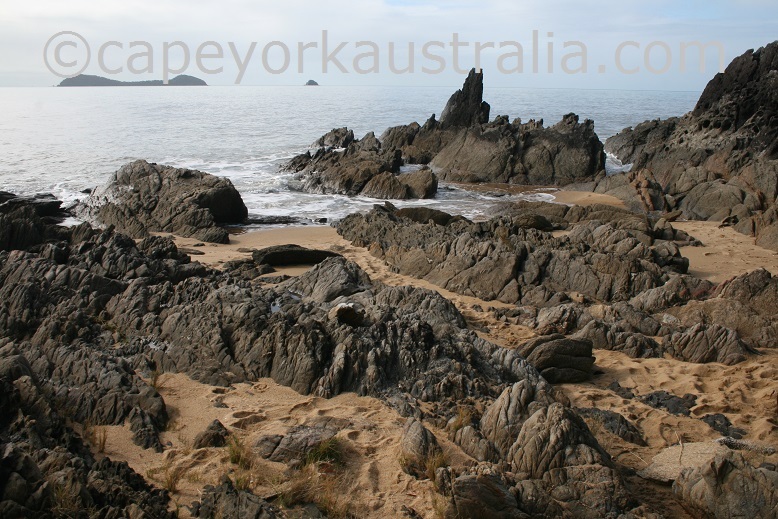 There is a walk in the northern end to a rocky headland and you can climb up onto the cliff and keep walking along the track - you come to a point where you can see all the way to Yorkeys Knob Boat Club. If you go to the northern end of Moore Street (one street back from Vasey Esplanade), you come to a creek and there is a nice rocky beach great for fishing. 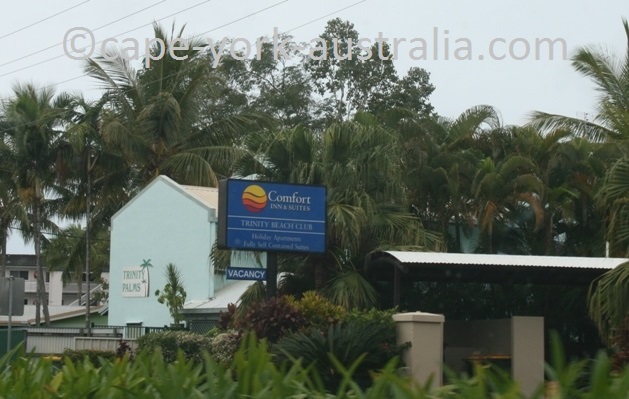 On this page you have the accommodation in Trinity Beach Queensland. 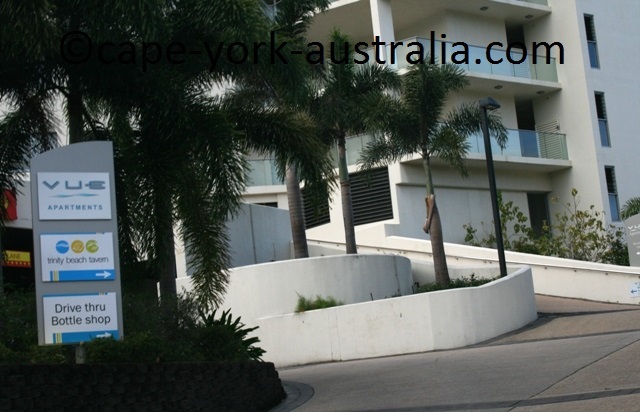 And there is plenty to choose from - below are the apartments, hotels and resorts. 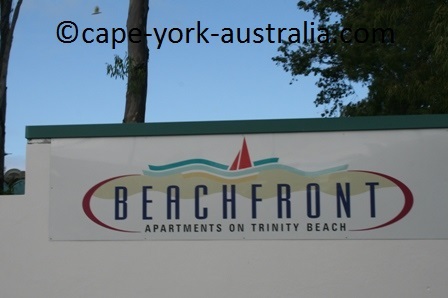 These apartments are located on the waterfront. 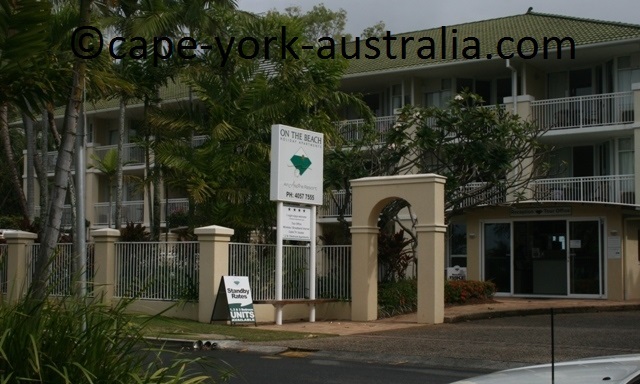 The apartments have ensuite bathrooms, fully equipped kitchens and large living areas. In the complex there are BBQ areas, two out doors saltwater swimming pools, off street parking and a tour desk. 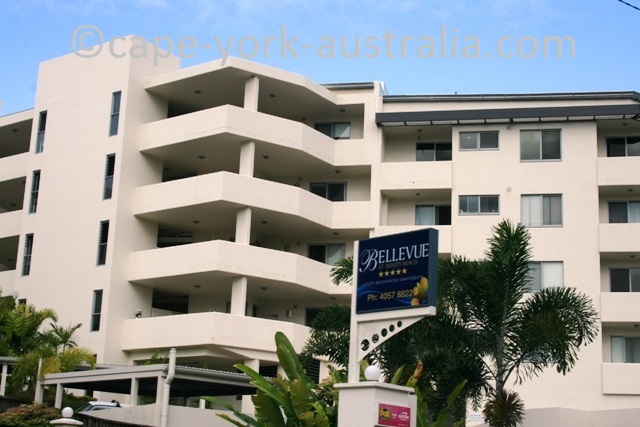 Bellevue at Trinity is a five star luxury holiday apartments with spacious rooms and entertainment size balconies with some great views over the beach and the ocean. In the complex there are BBQs, a lap pool, a kids pool and off-street parking. Comfort Inn is two blocks back from the waterfront. It has one and two bedroom self contained apartments with fridges, kitchenettes with coffee and tea making facilities and microwaves, TVs and internet. In the complex there is a swimming pool and a gym. 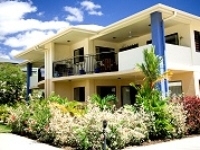 Costa Royale has both beachfront apartments and garden townhouses. Both contain air conditioning and in room safes. 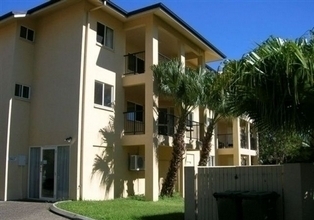 The apartments have large balconies with views, cooking facilities and laundry. In the complex there is a swimming pool and a BBQ area. 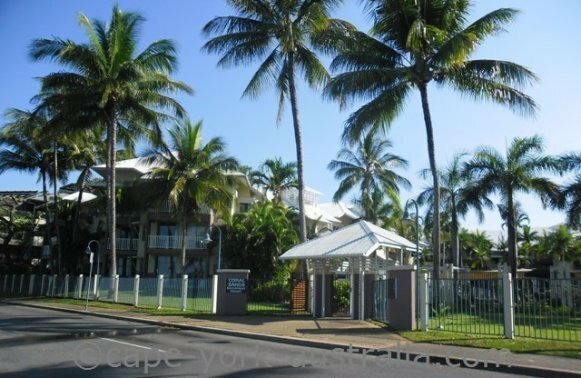 One block back from the beachfront, the Meridien has one, two and three bedroom apartments with kitchens / kitchenettes, TVs, wireless internet, DVD players and direct dial phones. Downstairs, there is a swimming pool and off street parking. On the Beach is on the beachfront, Vasey Esplanade. Rooms have kitchen facilities, private balconies and bathrooms, CD and DVD players, cable and satellite TV. In the complex there is a sauna and an outdoors swimming pool. 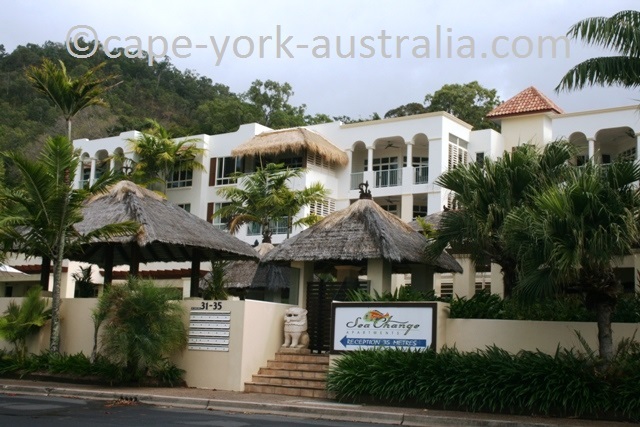 Oyster Court is away from the beachfront, but still close to it. 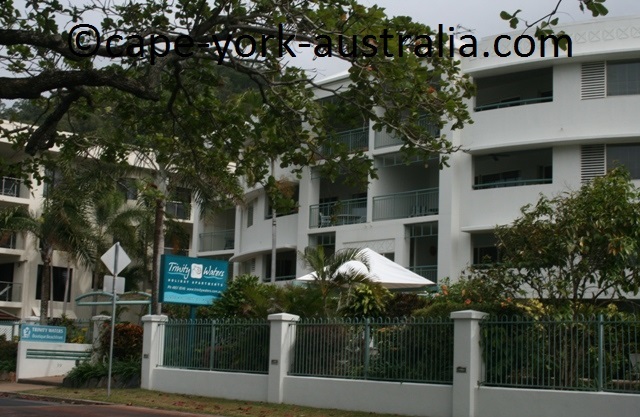 The fully self contained apartments have kitchenettes, balconies and laundry facilities. There's also wireless internet and off street parking. The apartments have four rooms but you can use less and pay less. 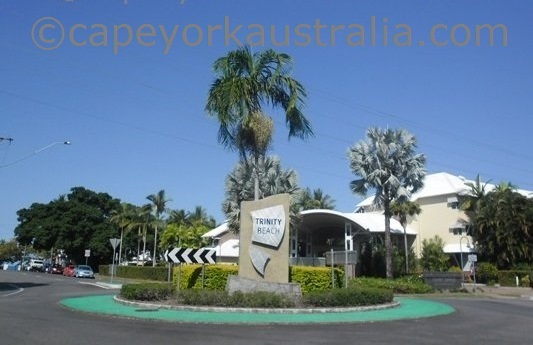 These are located on Trinity Beach Road a little walk away from the beachfront. The air conditioned rooms have cable and satellite TVs, CD and DVD players, and kitchenettes with fridges and tea and coffee making facilities. In the complex there is free parking and a swimming pool. Sea Change is located on the beachfront. 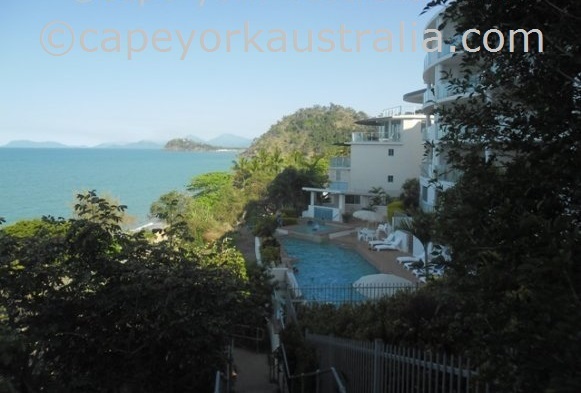 There are one, two, three and four room apartments with kitchen facilities, LCD and cable TVs, internet access, ensuite bathrooms, spa baths, king size beds, dining areas and balconies with views over Coral Sea. In this complex, there are two buildings in lush landscaped Japanese gardens with a water feature, a BBQ area and two swimming pools. The rooms have kitchenettes, cable and satellite TVs, CD and DVD players and direct dial phones. There is internet connection, a spa and a fitness room. These apartments are not on the beach front but a few blocks away. There are 32 fully self contained apartments with fully equipped kitchens, two bathrooms, a laundry, TVs, direct dial phones and balconies or courtyards. There is a spa and a swimming pool, BBQ area and undercover parking. 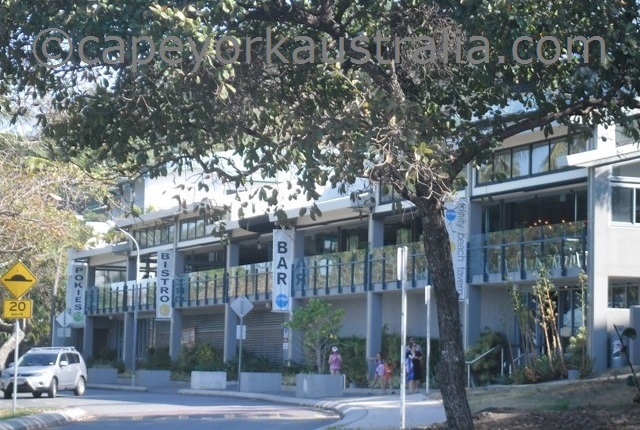 These apartments are right on Vasey Esplanade - one, two and three room fully equipped apartments with wireless internet and large balconies. 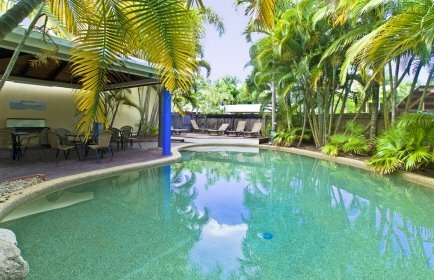 In the tropical gadens is a BBQ area, and a pool which is heated in winter. 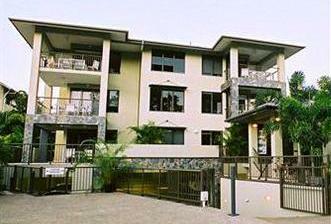 Vue apartments are on the beachfront. There are some good views from the balconies and a lovely large swimming pool at the front, and the rooms contain all the modern amenities. On the other side of the building are rooms with mountain views. Blue Marlin is on the Vasey Esplanade. The rooms have satellite TVs, internet and air conditioning. In the complex there are a private beach and outdoors pool. 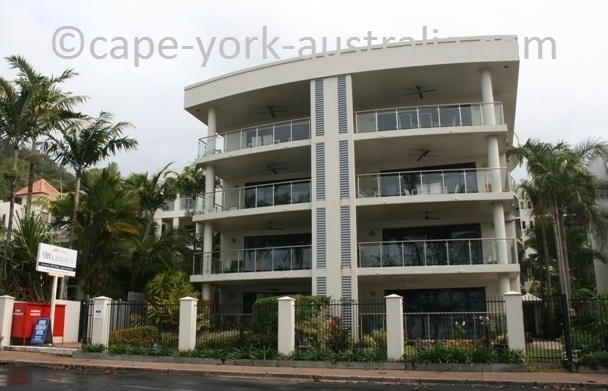 This executive property is in the south eastern end of Vasey Esplanade. It consists of two units only: Downstairs is the four-bedroom Pool Villa, and upstairs is the two-bedroom Penthouse. Both are very stylish, luxury and fully self contained and totally private from each other. Coral Sands is right on the beach front. It has tropical style apartments with kitchenettes with a fridge, private bathrooms, internet, TVs, and balconies. 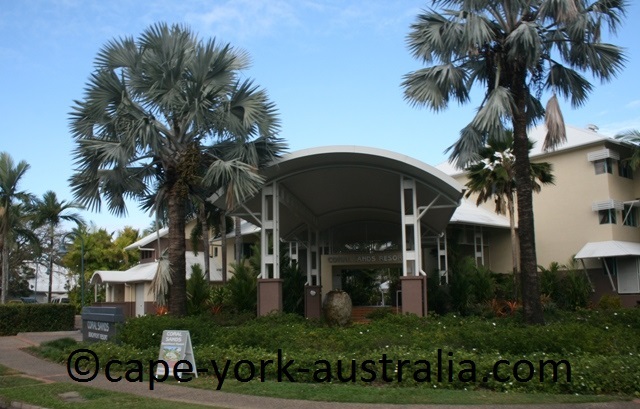 In the tropical gardens is a swimming pool, BBQ and picnic areas, a fitness centre, a private beach and an on site restaurant. 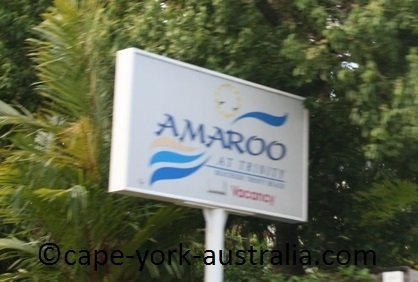 Amaroo is one street back from the beachfront. The rooms have kitchenettes with tea and coffee making facilities, TVs, in-room movies and private balconies / terraces, and spa baths. 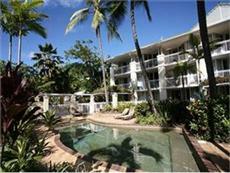 There is also a swimming pool, tennis courts, massage and beauty centre, Jacuzzi and a private beach. Blue Lagoon is two blocks back from the beachfront. There are studio units and two and three bedroom apartments with equipped kitchenettes, private bathrooms, a spa bath, and spacious living areas with TVs. In the garden there is a swimming pool, Jacuzzi, a gym, a picnic area and tennis courts. 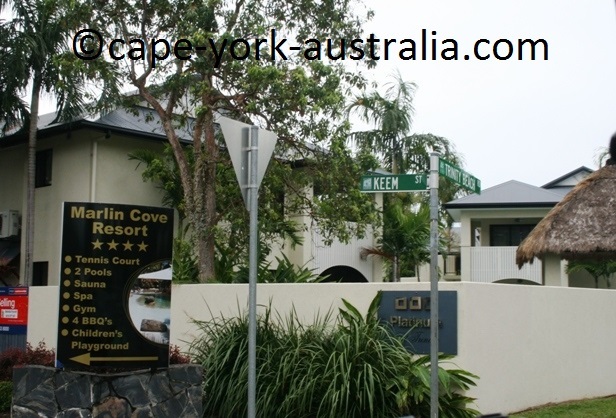 Marlin Cove is a few blocks behind the beachfront, in a walkable distance to the beach. There are one, two and three bedroom apartments with TVs, internet, kitchen facilities and private balconies. There are tennis courts and a swimming pool.